Robotic furniture that efficiently and elegantly multiplies your storage space. Sign up for email updates and be the first to know about product, exclusive offers and events. The status quo of static, unresponsive spaces is at odds with the flexibility we require today. We make better use of living space, giving you more room to live. The first-ever standalone walk-in closet. Expands to reveal spacious storage when you want it, and contracts to give you back your living space. 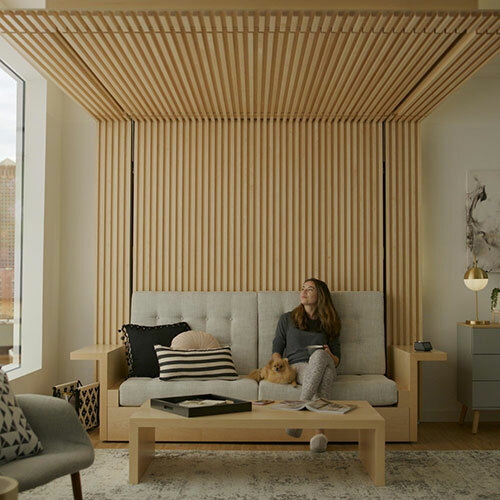 "Robotic furniture could be a boon to the real estate industry, helping to maximize small spaces for city dwellers." The Ori Studio Suite simulates the functionality of multiple rooms in a single, small, efficient space.